Here's a Blog containing info on the DCO of Fort Knox coming here. Is that a "no" on gas increases? MCCHORD AIR FORCE BASE, Wash. - For the first time since the chairman of the Joint Chiefs of Staff began touring the world talking to troops, the increasing cost of gas is popping up on their list of concerns. It didn't come up when it was $2 per gallon, or $3, but now, with the cost of a gallon of gas topping out at more than $4 per gallon, the subject has come up in the last four of his "all-hands" meetings starting last week at Fort Stewart, Ga., and now at Nellis Air Force Base, Nev., and Fort Lewis and McChord Air Force Base, both in Washington. "Every single session [now], the price of gas has come up," Mullen said. 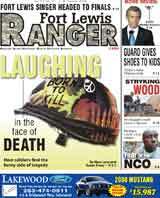 One soldier at Fort Lewis wanted to know if the Pentagon was considering a gas cost of living allowance, similar to a housing allowance. Not yet, said the chairman. Even if the idea were under consideration, he added, the process would take so long that it would be years before it would yield anything to put in the soldier's wallet. At Nellis Air Force Base, the price of gas is particularly disconcerting to Airmen who drive to Creech Air Force to work every day. The 100-mile roundtrip can sift through an airman first class's fuel budget quickly. There are shuttles available, but not all schedules are accommodated, officials said. Also, officials said, some Airmen live between Nellis and Creech, but have to drive to Nellis for their children's daycare and then turn around and drive to Creech to work, increasing their commute by half. There are no daycare facilities at Creech AFB. Even a modest increase in gas prices can mean hundreds of more dollars at the pumps annually for soldiers stationed at installations like the remote National Training Center, at Fort Irwin, Calif. The post is nearly 50 miles from the nearest city, Barstow. At 100 miles per round-trip, even a fuel-efficient car is costly to drive to work and back. At Twentynine Palms, Calif., it is more than an hour's trip to get to the nearest large department store, and a major city with popular recreation and shopping activities is easily 100 miles or more away. High fuel prices can dampen plans for deserving weekend getaways. Mullen called the rising cost of fuel a "significant fiscal challenge" for both operational and personal needs. He praised the Air Force today for leading the way in weaning itself off of fuel, noting that the service has begun flying some of its bombers with synthetic fuel. He said the rest of the military needs to follow suit. Typically, any fuel cost increase during the year is absorbed by supplemental budget requests submitted by the Defense Department, Mullen said. The Pentagon spends about $15 billion annually for fuel. But, Mullen said he thinks the days of multiple supplemental budget requests is nearing an end, and he added that he believes fuel costs need to be reflected in the overall budget. That said, if fuel prices are reflected in a fixed budget and costs rise, the money will likely come from personnel or acquisition funding, Mullen said. "Oftentimes you slow down or stop buying stuff," he said. Mullen said that all leaders need to be thinking about how to operate more efficiently, conducting the same operations with less gas "and not just assume it's always going to be there." He said leaders need to plan operations, transportation and family care, and manage them in a more efficient way. "We're going to have to make that right for the future," Mullen said.